Applying driveway sealer isn't a job you have to call in professional driveway painting contractors to do. Although sealing a driveway isn't a job you can complete in a few minutes, with the right tools and techniques you can have the job done in one day. There are different ways to apply sealer to a driveway; one of which is with a paint roller. Applying sealer with a paint roller ensures a smooth, even coating on the surface. The work also goes faster when you use a paint roller instead of a paint brush. You could also use an asphalt sealer squeegee, but this method isn't recommended for acrylic-grade sealers. 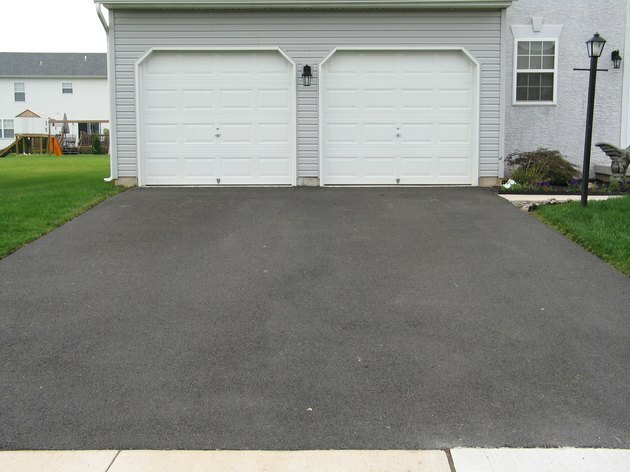 Whether you have an asphalt or concrete driveway, sealing it is an important part of maintaining the surface. Sealer helps to keep moisture from getting into the concrete or asphalt, which can eventually cause it to crack or crumble. It also helps to prevent the expansion and contraction of the driveway surface caused by thawing and freezing during weather changes. Sealing makes maintenance easier, too, by protecting the surface from grease and oil stains. Because paint rollers give even coverage, they are very useful in properly sealing a driveway. A variety of sealers are available and it's important to choose one specifically designed for your driveway surface. Penetrating and surface sealers are the most common. Penetrating sealers work best at penetrating the pores of the surface and keeping moisture out. Surface sealers do not penetrate the concrete or asphalt, which make them less effective at protecting the driveway. Surface sealers also require more frequent upkeep, requiring reapplication every two to three years. Penetrating sealers, however, can last for up to 10 years. Driveway sealers are usually either solvent-based or water-based and rollers are recommended for both. Water-based products make cleanup easier though. Before applying the sealer, it's necessary to properly prepare the driveway surface. If the driveway is freshly poured, allow it to cure for at least three weeks before applying sealer. Fix any cracks or holes in the driveway with a concrete or asphalt patch and allow it to dry completely. Sweep loose debris and dirt from the surface with a broom, then scrub the entire driveway with a stiff scrub brush and a cleaner to remove grease and other substances. You can also use a power washer to clean the driveway prior to sealing. Let the driveway dry for 24 hours before applying sealer. Use a 3/8-inch nap paint roller to apply the sealer. Stir the can of sealer with a clean stick before you begin so it's thoroughly mixed. Starting at the back center of the driveway, pour enough sealer directly onto the surface to coat at least a 10-foot by 10-foot area. Spread the sealer over the surface with the roller, overlapping your strokes to ensure even coverage. Move the roller back and forth, pushing the sealer outward toward the driveway's edges. Apply the sealer in a thin coat. Once you've covered the entire driveway with sealer, let it dry according to the manufacturer's instructions -- usually about two to three hours. Then apply at least two more coats, allowing each coat to dry before applying the next. Apply all coats of sealer to the driveway on the same day to avoid variations in color. Let the driveway dry completely for about 48 hours before allowing foot or vehicle traffic back on the surface. Apply sealer to your driveway in the warmer months of the year. The temperature should remain above 60 degrees for at least two consecutive days when applying the sealer. Check the forecast and make sure no rain is expected for at least two days. Wear old clothing when applying sealer to the driveway as the sealer may spatter off the roller. If you get water-based sealer on your hands or skin, simply wash it away with warm soapy water. To remove tar or solvent-based sealers, soak the affected area in olive oil and then rub away the residue. Although a large paint roller kit is usually the best way to apply driveway sealers, avoid using a roller if the sealer you're using has a solids content above 35 percent. In this instance, a concrete squeegee will likely work best. When Is the Best Time of the Year to Seal a Blacktop Driveway?